A3 Size 10.5 x 15.4 in. (266 x 391 mm) 11.7 x 16.5 in. This intricate pen and Indian ink drawing on art board is a view from the hallway of John's house in Torquay, looking through the bamboo curtain into the kitchen. John made this glazed ink drawing in 1979, which compliments his other pen and ink drawing, Through the Magic Curtain. Of these drawings he wrote: "A drawing, A1 size, of the kitchen, looking into it from outside in the passage and, significantly, through the bamboo curtains, is underway. Each session so far on this drawing has provided a growing enthusiasm. Each time I have waited for the daylight to drain away and for night to come, only then have I dared to look across at the window to draw this area. I want it to boldly establish a strong effect of contrasted light so that it cocoons a vibrant intricacy and that the drawing sparkles." 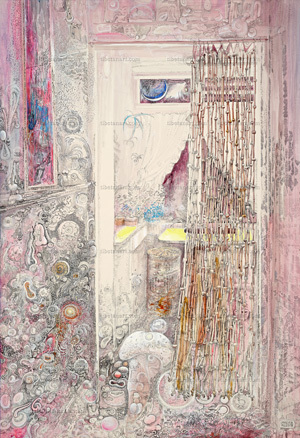 The second drawing of the kitchen, this time seen again through the beaded bamboo curtains, but from deep in the passage outside Jason's room. The drawing can only be made at night. An intense effect of light is sought and it will finish as a detailed chiaroscuro ink drawing using 02 and 05mm drawing pens. The drawing of the passage is now in technicolour with coloured inks glazed over the black pen lines. It fills me with a strange excitement, although I cannot yet control the means of projecting this. If the drawing fails, which I fear it must, at least it will move me closer to total expression. This drawing has raked up feelings of colour fresh from my past in the 1960's. I am so happy to meet these old feelings again. A few days ago on Radio Three there was an excellent programme about Eskimos. In particular there was an old Eskimo aged 85 years who seemed to be carrying in his mind all the heritage of the Eskimo culture. The interviewer, who clearly delved with the obsessive intensity of a man who loved his subject, recorded the old man for posterity. It had the poignancy of being in the presence of the last dodo. One story concerned a hunter who after many days of fruitless hunting had become tired, hungry, lonely, and extremely depressed whilst wandering over the icy wilderness. Suddenly he came upon travellers who immediately displayed great kindness, giving him food, drink, blankets and their most beautiful woman. He soon was under the blankets with her and very happy. In the morning he awoke cold and alone. No travellers, no blanket, no woman; only on his chest some feathers from the wing of a ptarmigan. He had not met people; he had met the ptarmigans. This is so symbolic of the elusive love that I have always searched for that I would like to make a painting about it.